Texture Jewelry - This is a beautifully handcrafted sterling silver bold pin/pendant combination that features an oval red orange Carnelian cabochon (18mm x 13mm). Wear this fun high polished art jewelry piece as a pin or as a necklace with a chain. 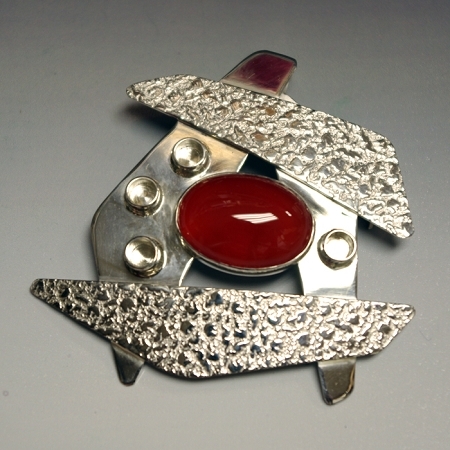 Handmade sterling silver pin / slide with an oval carnelian cabochon. This is a versatile piece as it can be either worn as a pin or on a chain as a necklace. Handmade and signed by Aaron Rubinstein and Modern Art Jewelry.